Scripture: Mathew 14:14 When Jesus landed and saw a large crowd he had compassion on them and healed their sick. 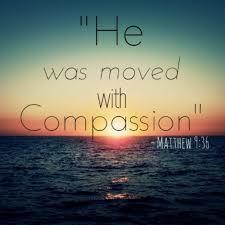 Observation: I look back on my life when Jesus had compassion on me. I wasn’t following him or even thinking about him, but he was always there, protecting me, supplying my needs with his grace and mercy. I will never understand why he loves me so much and why he would have compassion on this sinner, but he did and healed me. Application: As Jesus has compassion for me I need to share that with others. My testimony of God’s love for me will open the eyes of others so they may see the compassion Jesus has for them. Each day my Lord shows me his love and compassion as he gives me another day to share. Prayer: Dear Lord I thank you for your love and compassion. May I honor you by fulfilling the purpose you have created me for. Take this laziness away from me so I may serve you totally.